This carrot walnut cake has become a new favorite. I have substituted brown sugar for the white sugar in the original recipe, cut the amount of sugar in half, and also cut the amount of oil in half, and substituted applesauce for the rest of the oil. There is a lot going on in this cake… lots of textures and flavors… and we think it is the best carrot cake we have ever eaten. Using a whisk, thoroughly mix together the flour, baking soda, salt, sugar, and spices. Stir in the carrots, nuts, and raisins and pour the batter into a parchment-lined or oiled and floured eight or nine-inch square pan. Bake in a preheated 350°F oven until a toothpick inserted in the center comes out clean… approximately thirty minutes. Cool the cake in the pan on a rack for fifteen or twenty minutes. Remove the cake from the pan and allow it to cool completely before frosting. We actually prefer this cake as-is, unfrosted! This looks great, I am going to have to try it! I stumbled upon your blog a few months ago as I was looking for information on basket making – my new interest. I keep coming back, checking out new posts and perusing old. Thanks for having a nice sight to go to for all kinds of information, and I love what you’ve done to the place (the recent updates)! I love this – especially the way you have changed the recipe to use so little oil and so much less sugar. If it tastes as good as it looks and if it’s like the rest of your recipes it will – the cake will be delicious. Thanks for sharing and once again thanks so much for this wonderful blog. Could you tell me how you plump the raisins? I really am eager to try this recipe but I see there are several ways to plump raisins and I wondered how you do it. Daryl, I add the raisins to boiling water and take the pan off the heat. After about ten minutes I drain them in a colander (and if I’m in a hurry then on paper towel) until they are dry. 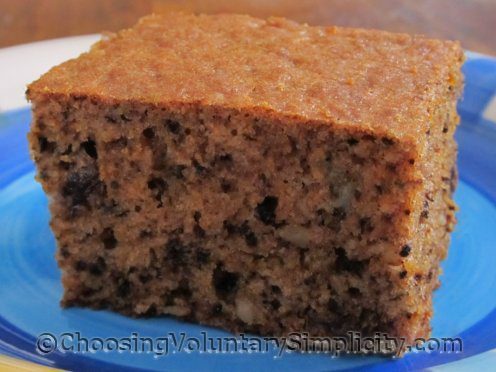 Plumped raisins make such a huge difference, I think, in a recipe… I always plump raisins for cakes or cookies. So nice to see a recipe for a smaller cake. Those 9×13’s are just too much when there’s only 2 in a household. Made this for my husband today. He wasn’t even done before he told me this was definitely a do again. It was the perfect size also.😁Thanks for the recipe!